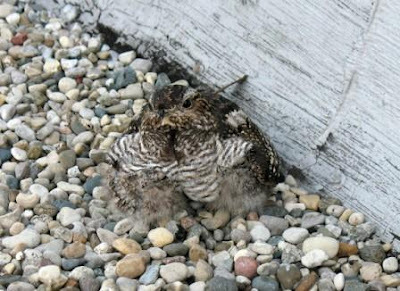 Back in late July, Dan Adamski sent along photos of nesting nighthawks on the roof of the University Medical Center in Toledo. Later, he passed along more photos as the nestlings grew. About nine days ago Dan sent me a few photos of the remaining juvenile. It appears that the other youngster had flown the coop by the time Dan had returned from a vacation, and I'm sure the one pictured below has by now. One of the problems with blogging about natural history is that there is never any shortage of subjects, otherwise I would have had Dan's most recent photos up much sooner! Here we find the young bullbat on August 21, looking just about like an adult. Still has traces of down peeking through, and nice rich buffy feather edging, but this one should be pretty near flight-ready. His nestmate has already left the nest. 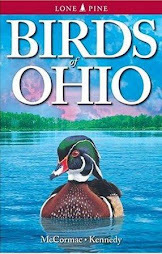 By now, this bird could be quite far from Toledo and Carty Finkbeiner. Nighthawks engage in long-distance migrations to South America. When you think about it, a bird like this is a true engineering marvel. Not only does it have to engage in a 6-7,000 mile one-way peregrination to the Amazonian Basin within weeks of taking wing for the first time, it also has to learn to catch insects high in the sky. Nighthawks are aerialists supreme, and much of this talent must be genetically encoded. Anyway, much gratitude to Dan Adamski for sharing the story of this rooftop-nesting bullbats with us, and here's hoping that both youngsters make it successfuly to the tropics, and return to the Buckeye State next year. Rare birds are always exciting. Especially when they are giant and prehistoric in appearance. Wood Storks certainly qualify. Thanks to Robert Schlabach for following up on a report in Coshocton County from last Monday, and getting the word out. He found two storks at the reported locale on Tuesday, and yesterday a third bird materialized. They are still present; I saw them between 8 and 9 am this morning. Ground zero for the Wood Storks. 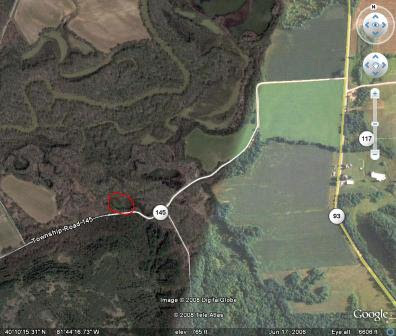 The small wetland they are frequenting is outlined in red. This site is several miles south of Coshocton, in southern Coshocton County. Township Rd. 145 goes east-west between State Rtes 83 and 93. This road travels along low-lying and oft-flooded Wills Creek, and there are interesting wetlands galore in the area. This is the stork habitat. Those three white dots are our birds. As Bruce Glick had noted in a posting to the Ohio Birds listserv, this area has a very Floridian feel to it, with plenty of swampy ground. The storks must feel right at home. I can't wait to get back and do a bit of botanizing. In my short trip, I saw a number of interesting and unusual plants, some of which are often indicators of other good stuff. Should be lots of dragonflies in the vicinity as well. Three juvenile storks. If their bills were above water, which they seldom were, you would see that they are pale ivory-yellow - a character of young birds. Storks feed in large measure by feel. The tips of their bills are sensitive and they feel around in mucky water where it is often too cloudy for visual prey detection. A better view of one of the birds, albeit head still submerged. This morning was very dark and misty - not good conditions for photography of birds, and I didn't manage many good shots of the storks standing upright. Most of the prey that I could see them catching appeared to be crayfish, perhaps some snails, and other small aquatic life. This one lucked into a big Longear Sunfish, and had fun wolfing it down. Once he got it headed the right way, it wriggled down the gullet fairly readily. This was at least the sixth Ohio record. The first came from July 23, 1909 in Clinton County, and oddly, the second record came from very near the first locale on May 5, 1946. The next documented record came from Ashtabula County on July 1 & 2, 1955. An amazing seven birds were seen in late June of 1966 in Hancock County, and became short-lived local celebrities. The last record was from Portage County on September 9, 2001. 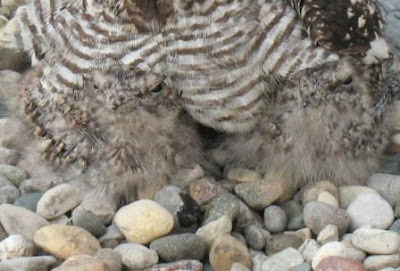 There are other records that were probably correct, though, such as two birds in Ottawa County on August 4, 2004. Wood Storks are well known for post-breeding dispersals northward from the Florida, Georgia and South Carolina breeding colonies, and there are many records from the Midwest. So, while the appearance of these birds is not unexpected, it is still a great record. So far, while seemingly oblivious to the hubbub they are creating, these three storks have been observed by dozens of birders. I hope that everyone who wants to see them gets over to Coshocton County. Took a whirlwind trip around quaint Cape May, New Jersey last Saturday, and saw lots of interesting flora and fauna. It wouldn't be possible to visit and NOT see interesting things. As usual, many megs of photos were taken, but I wanted to share a few classic birds of the beach. Spent a fair bit of time botanizing - there is some very cool halophytic (salt-adapted) flora there, and I got some nice shots of some of it. More on that later, perhaps. Speaking of plants, it was somewhat depressing to see how badly non-native species have taken over some of the habitats in Cape May. Weeds like Porcelain-berry, Ampelopsis brevipedunculata, and Japanese Knotweed, Polygonum cuspidatum, cover vast swaths of great migratory bird habitat. Anyone who doubts the ecological damage that these vegetative pests can do need only pay a visit to a place like Cape May. Beachfront Cape May with the famed lighthouse off in the yonder. This area is owned and managed by The Nature Conservancy, and is one of the best remaining oceanside habitats. Royal Terns abound on the beach. Here, a squawking juvenile begs for food. Like Caspian Terns, the young of this species follow the adults around long after being fledged, demanding handouts from the long-suffering adults. It was nice to see these diminutive little Fish Crows, and hear their odd laughing snorts. American Crows were also about; the size difference between the two is conspicuous. Fish Crows are coastal in distribution, ranging up the Mississippi Valley. They should eventually be turn up along the Ohio River in Ohio. This one had a cheese puff or something probably equally unhealthy. Crows are not noted for discerning palates. Plenty of Black Skimmers were around. The Nature Conservancy protects large areas of beach, to improve nesting success of this species along with Piping Plovers and Least Terns. Black Skimmers are wild-looking birds. They even attract the attention of non-birders. While photographing them, I was approached by some people who wondered what they were. They kind of look like little street toughs, wearing hoodies pulled down low over their eyes. Their bill is a marvel of evolution. Skimmers skim: they fly along the water's surface, dipping the lower mandible in as they course along, thus snatching up tasty aquatic morsels. Hope to share more on The Cape later. I write this blog from Owings Mills, Maryland, a beautiful tree filled suburb of Baltimore. I am indeed fortunate to have been put in contact with Donna and Henry, my hosts, who are putting me up in their gorgeous house overshadowed with towering Tulip Trees. I'll be speaking at the nearby Irvine Nature Center's annual Native Plant Conference tomorrow morning. They've been doing this event for some twenty years, and always attract a good crowd. I'm looking forward to that, and being on the same slate with Doug Tallamy and William Cullina. Hard acts to follow. Since the incomparable Cape May, New Jersey is only about three hours off to the east, I'm planning on going there Sunday. If it works out, I'll have some cool stuff to share, I'm sure. Anyway, I just got some really cool stuff for my camera. They are mega-macro lenses, and are awesome! It's like shooting photos through a microscope. A bit of a learning curve to figuring out light settings, apertures, and that sort of thing, but I had my first self-taught lesson last night. A few photos follow... This tiny little beast is one of the treehoppers, and several dozen of them could pack onto a quarter. During the day, they often wedge into the axle of a leaf, blending remarkably well with the plant. At night, they become more free-ranging, although when spooked by giants with flashing lights, still tend to retreat to the junction of a leaf and stem, where they at first blush look remarkably like a stipule. This tiny cricket is a Say's Trig, I believe. It is a quarter-inch or so in length. You've heard trigs. They produce low trills that are an oft-present background noise. This species makes a musical, silvery trill that carries well, considering the miniscule size of the musician. As you can imagine - or may not be able to imagine - I was quite pleased to find this big katydid. It produces an interesting and very distinctive song that sounds a bit like a raspy frog - ree-dip! It's an Oblong-winged Katydid, and like the rest of their ilk, can be very hard to find. Nearly impossible during the day, when they sit around in the foliage looking just like leaves. I heard this one, and finally located him sitting low on the leaf of a Giant Ragweed. Like nearly all katydids, they are nocturnal and sing at night. Keen of senses, they'll clam up when a person draws near, increasing the challenge of finding the songster. A closer view of its upper body. We know it's a male, one, because it was singing, and two, because of that traingular brownish patch. That is the stridulatory area; the parts that he scrapes together to produce his song. These raspy melodies are known as stridulations. Katydids are beautiful and fascinating insects, but certainly underappreciated. Few people ever see them! A closer view of the base of the Oblong-winged Katydid's wings. These insects are essentially doing what male birds do - singing to attract mates. The singing insects start to come on strong just about the time that our breeding birds are waning, having already fledged their young. For birders, learning the insect vocalizations can be terrific practice for keeping one's ears in tune. From mid-July til frost, you'll have a bounty of challenging new subjects to learn. I've said this before, and I'll repeat it again: if you have any desire to be reincarnated, don't come back as a bug! Even the top end predatory insects/arachnids have their enemies, as we shall see. For the insectophobe and/or arachnophobe, the following will be straight out of a horror movie, so be forewarned. Here we have two of the beastliest beasts in their respective worlds. On the right, a giant eight-legged venomous fanged wolf spider. You've seen 'em; they are massive, fast, and hairy, and race around overpowering prey. On the left, a large ferocious-looking spider wasp, with the specific name Entypus unifasciatus. Two critters that could understandably give one the creeps, and both are near the high end of their respective food chains. What happens when they meet? Well, it must be quite a clash! We, unfortunately, happened along soon after the battle, and thus didn't witness the takedown. But what essentially happens is this. The wasp, one of seven species in its genus, ranges throughout eastern North America. It specializes in capturing wolf spiders. Not any old wolf spiders - the BIG ones. Wolfspiders are quite formidible in their own right: full of venom, a bunch of good eyes, and eight powerful legs that make them agile and fast. The wasp wants the spider badly enough to take it on face to face. It patrols suitable habitat, and when a wolf spider is spotted, it tries to maneuver itself into a position where it can successfully sting the spider, filling it with a powerful toxin. A bit tricky, this business, because the big bad spider does not want to get stung by a large wasp and filled with a powerful toxin. In this case, all worked out well for the wasp, and not so well for the spider. The spider is now subdued - alive, possibly aware of what's going on, but almost totally paralyzed. Every now and then a leg would twitch in an involuntary spasm, but otherwise it was putty in the wasp's hands, so to speak. So when we came along, the wasp was methodically dragging the spider over the ground. Where? It will have previously excavated a burial chamber in the soil, and that's where it's headed with the victim. Upon reaching the burrow, it will pull the spider in, lay one egg on its body, and seal it in. When the young wasp hatches, it will begin consuming the soft edible parts of the spider. The neurotoxin injected by the adult wasp keeps the food alive, so Junior has fresh meat to snack on upon emergence. After feeding and growing, the wasp will pupate in the burrow, and emerge as an adult next summer, starting the whole savage cycle over. Thanks to Janet Creamer for spotting this drama and bringing my attention to these beasts. Bird Watcher's Digest celebrates its 30th anniversary this year, a real milestone for any birding publication. Indeed, no other birding magazine other than BWD has been around long enough to celebrate their pearl anniversary. The bird watching scene has changed a lot since BWD's inception. When the inaugural issue arrived, I was a 16 year old high schooler, and I knew precious few others who appreciated birds like I did. I kept my interest in birds under wraps, for the most part, and we were akin to an underground cult, at least those of us in my age bracket. Not so today. Clubs abound, and other bird-related magazines have proliferated. An estimated 50 million U.S. residents actively watch birds on some level. We make a major economic impact, too: some $14 billion is pumped into the economy each year by bird enthusiasts. BWD has been there through it all: real pioneers jumping into the unknown when Bill Thompson Sr. and his wife Elsa took a gamble and launched the mag. They both still take an active role in BWD, but day to day stewardship has passed to the able hands of their sons Bill Thompson III as Editor, and Andy as Publisher. Daughter Laura oversees circulation, keeping the magazine family owned and operated, and close to its roots. This recipe works. BWD remains the most interesting, informative, and enjoyable of birding mags. 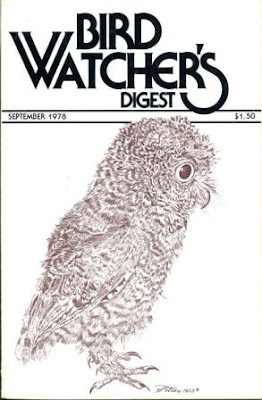 The cover of Bird Watcher's Digest's first issue, September 1978, featuring a young red morph Eastern Screech-Owl. I am proud to say that I was one of the original subscribers and still have this issue sitting on my shelf, along with many others. Over the years, many of our leading ornithologists and birders have taken pen in hand for BWD, writing stories and columns for its pages. Luminaries like Roger Tory Peterson, Kenn Kaufman, David Sibley and many others. The most recent issue featured another nocturnal species closely related to the screech-owl on the first cover; the Whip-poor-will. I still am amazed that I now write for the mag occasionally, and am very flattered by the opportunity - the whip cover story in the last issue is mine. I would not have guessed at this turn of events when I was sixteen and devouring those original BWD issues. We recently had a meeting at BWD corporate headquarters in Marietta, Ohio, and I took the opportunity to lure everyone outside for a group photo. This picture is cool because in addition to all of the wonderful folks who make BWD go, the two founders, BT2 and Elsa, are here as are BT3, Andy, and Laura. From L to R: Bill Thompson III, Helen Neuberger (trying to hide), Susan Hill, Jim Cirigliano, Laura Thompson Fulton, Elsa Thompson, Bill Thompson (the good-looking one), Ann Kerenyi, Andy Thompson, Linda Brejwo, Claire Mullen, Jamie Tidd, Emily Breen, and out front Pokey the Wonderdog. Customer service reached an all-time low while this photo shoot was being set up! If you don't get the mag, and you like reading about birds, I'd recommend a subscription. In fact, I will make an unadulterated and unabashed plug. Go right here. Probably no other popular group of animals illustrates the plant-animal link as vividly as butterflies and moths. Their larvae in nearly all cases are utterly dependent upon plants for food, and these relationships often are quite specific. At last weekend's Appalachian Butterfly Conference, we certainly didn't ignore the plants, and many skilled botanists were around. Early August is an incredible time in regards to floristic diversity in Shawnee State Forest and the nearby prairies of Adams County. Most of our participants were totally into learning about plants, especially how they interact with butterflies. Following are two very cool orchids that we found over the weekend. Ghostly pale spires of flowering Cranefly Orchid, Tipularia discolor, thrust forth in the dappled light of an oak forest. This is not an in-your-face orchid, and even plants in full bloom would be quite easy to pass by. Tipularia refers to a genus of craneflies: long-legged gangly insects that look like mosquitoes on steroids. The flowers of this odd orchid are reminiscent of these insects. Closer view of the spindly flowers with their long spurs. Cranefly Orchid is easier to find in winter. In late fall, long after the flowering stalks have faded, the plants send up evergreen leaves that are dark green above and dark purple below. These leaves overwinter and photosynthesize, providing energy to the roots. By late spring, the leaves have withered into nothingness, and in mid-summer these strange flowering shoots jut above the leaf litter. The flowers are pollinated by night-flying moths in the Noctuid Family. The orchid's flowers are noctodorous - they issue a fragrance only at night, to attract their nocturnal pollinators. The oddly asymmetrical flower arrangement ensures that the moth's fuzzy eyeballs will be forced into contact with pollen, which will then be transported to the next orchid. It's an odd and wacky world out there. Thanks to the sharp eyes of Kevin Bradbury, we found a much showier representative of the Orchidaceae in this powerline right-of-way. This one can't be missed. It's the threatened Yellow Fringed Orchid, Platanthera ciliaris, which is only known from three small regions of Ohio. There were over 100 plants growing in this sunny opening; one of the better populations known. These orchids were a real hit, and nearly every group stopped by to pay homage. Few plants have the shock factor of Yellow Fringed Orchids. The color alone is enought to stop one in their tracks, and even plant-haters would feel some admiration for it, I suspect. Many orchids are highly dependent on disturbance, whether it be mowing, fire, or soil disturbance. This powerline was probably mowed last year, stimulating a healthy emergence of orchids this year. We didn't ignore the dark side of Ohio's Lepidoptera at the recent Appalachian Butterfly Conference. To do so would be to ignore the vast majority of flying scaled things. 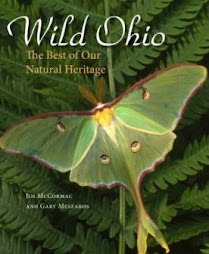 After all, there are about 135 species of butterflies known from Ohio, and an estimated 2,500 moths! The learning curve is huge with the latter group, and we were greatly aided by Dr. Dave Horn, Ohio's "Moth Man". 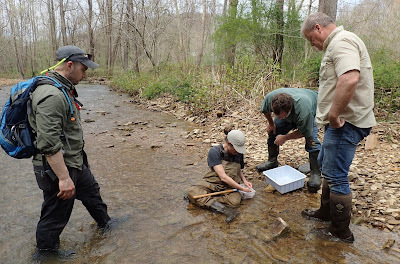 Dave is Director of the Ohio Biological Survey, and extremely generous with his time and expertise. There were so many moths about, we found them perched about here and there, but the majority were caught by Dave's blacklight operation. Following are a few highlights. A random assortment. The big brown one is a Tulip Tree Silkmoth, Callosamia angulifera. It is pretty specific to Tulip Trees for a larval host plant, hence the common name. Next to it is a Luna Moth, Actias luna, which is utterly unmistakeable. We saw lots of them. The others? I don't know, and that's par for the course, at least with the little brown jobs, at least for a piker like myself. Closeup of a male Luna. The sexes can be told by their antenna, which in the case of the male is broad, feathery, and rather fernlike. They use them to detect female pheremones, sometimes from mind-boggling distances. The giant silkworm moths don't last long: they live for only a few days and their sole purpose is to mate and in the case of the female, lay eggs. They have no functional mouthparts and don't feed. Luna caterpillar. We found and photographed these last year, near the spot where we captured the adult above. The cats are giant and rather showy. Huckleberry Sphinx, Paonias astylis. This was a cool one, and a life moth for many. They feed on the several species of blueberries, Vaccinium, that occur in the forest, and presumably Huckleberry, Gaylusaccia baccata. Rosy Maple Moths, Dryocampa rubicunda, are abundant generalists but always crowd pleasers. Their color scheme of pink and yellow is something not too often seen in nature, at least in these parts. Thank again to Dave Horn for the experience! This weekend past marked the first - and hopefully not the last - Appalachian Butterfly Conference. This event is something we started thinking about a few years ago, and first met to begin planning about a year back. It was great to see it finally come to fruition. 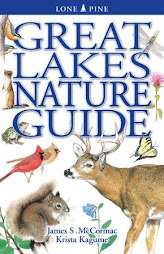 The main organizers and sponsors were the Ohio Division of Wildlife, the Shawnee Nature Club, Flora-Quest, and Ohio State Parks. Everyone involved did a stellar job of organization. So did our guides and speakers, and we had some of the best field people to be found. Thank you all. ABC is breaking new ground in an arena that will probably only grow - butterfly ecotourism. Our venue was Shawnee State Forest, and the butterflying there is every bit as good as the birding and botanizing. It was cool to see about 85 attendees pretty much fill the Shawnee Resort and many of its cabins. I'd say that this one will only get bigger in future years. In addition to Ohioans, there were folks from Indiana, Michigan, Kentucky, Florida, and Wisconsin. We even had an enthusiast in all the way from the Big Apple - New York City! These events would be impossible to pull off were it not for the generosity of experts who donate their time and talents to help others learn. Here we have John Pogacnik scampering about trying to photograph a tiger beetle, while Jim Davidson looks on. That's John's wife, Lisa, probably wondering why John never grew out of chasing bugs like most of the other boys. Jaret Daniels, author of Butterflies of Ohio among many other things, was our keynote speaker. And much more. Jaret was a topnotch guy and complete field man. He came all the way from the University of Florida to be with us, arriving a day early so he could learn more about the Shawnee region and do some additional butterflying. He also stayed late, and we went into the field some more after the conference. You couldn't ask for a better man - great speaker, mad skillz in the field, and great with people. Every discipline needs more ambassadors like Jaret. Here he kindly signs my book, deep in the heart of Shawnee Forest, at a spot where we had just found an unusual butterfly, the Golden-banded Skipper. Lots of prep work went into this conference. A bunch of us went out in the field beforehand and identified good butterfly congregation spots, then augmented them with rotten peaches. Many species visit fermenting fruit; kind of like feeding birds. Here, Kevin Bradbury, manager of Shawnee State Park, prepares to tip some peaches, while John Howard apparently is chiding Janet Creamer for trying to nip into the bait. That's Shawnee naturalist Jenny Richards in the maroon shirt. The one variable that always gives planners angst at these field trip-based events is the weather. Especially with butterflies, which just won't fly if it is rainy, and don't even show themselves nearly as much if it is heavily overcast. Not a problem and we had a great diversity of many species under sunny skies. Here, a Silver-spotted Skipper alights on the cap of a participant. In all, we tallied 61 species, many in large numbers. Rarest were several Clouded Skippers. There were only a few Ohio records prior to these reports. One of our most beautiful butterflies and an immigrant from the south, the Common Buckeye. This one was seen at Sandy Springs along the Ohio River, along with many other cool species like American Copper, Hayhurst's Scallopwing, and Checkered White. A personal favorite is the Red-spotted Purple, which looks very tropical. Many were about. One of the real highlights was this Golden-banded Skipper. It was a "lifer" for many. They are not common, in spite of the fact that their host plant is Hog-peanut, Amphicarpaea bracteata. This little vining member of the pea family is everywhere. It was cool to see such a diversity of enthusiasts together and having such a good time. There were newer butterfliers who were thrilled by their first good closeup of the undersides of an Eastern Tailed-Blue, and more advanced people that were elated by the much less showy Clouded Skippers. No matter the level of experience, all seemed to have a good time. As you may imagine, I got many megabytes of photos at this gig, and will try to share more, later. We also had some spectacular nighttime trips that yielded outstanding moths. I'll try and put some of those up later. Again, thanks to all who took on leadership roles to make the Appalachian Butterfly Conference a reality, and to everyone that attended. 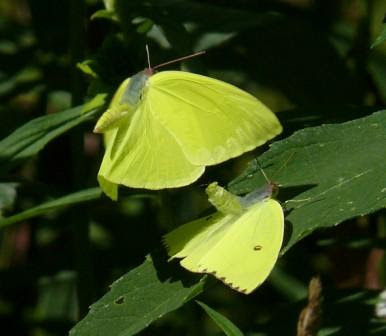 In the definitive modern academic work on Ohio butterflies, Butterflies and Skippers of Ohio (1992), the authors have this to say about the Cloudless Sulphur, Phoebis sennae: "...it rarely reaches Ohio." Not anymore. These large, beautiful butterflies that look like flying lemon wedges have become quite regular, their numbers definitely increasing. Variable numbers occur every year of late, and sometimes big numbers. Their common host plant is Wild Senna, Senna hebecarpa, and Cloudless Sulphurs regularly now reproduce here where the plant occurs. John Pogacnik, who lives on the shore of Lake Erie in Lake County, gets scores of butterflies in his yard. To encourage butterflies, John has planted flora that are attractive to them, including Wild Senna. With great results, as we'll see. The following series of amazing photos were taken by John in his yard recently. 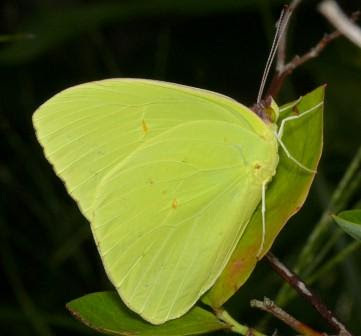 Gorgeous Cloudless Sulphur. This is a male. These are massive in-your-face buttery-colored sulphurs tinged with green. WAY bigger than the common Clouded Sulphurs that one sees everywhere. John's amazing shot of a pair, male above, female below. They are preparing to make more Cloudless Sulphurs. 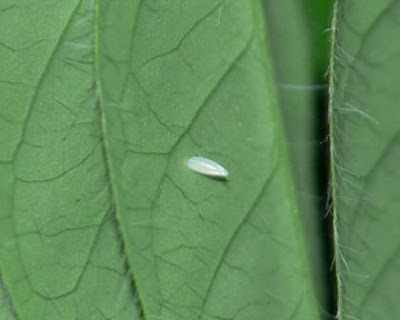 The result of their coupling: an egg laid on a Wild Senna plant in John's yard. As he says: "plant it and they will come". 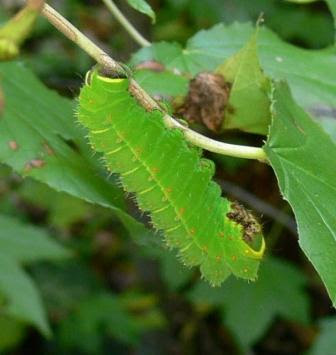 Eventually the egg hatched into this resplendent yellow-striped lime green caterpillar. 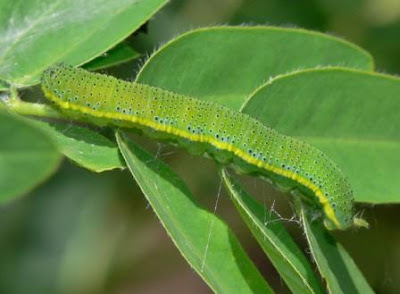 After a period of fattening on the leaves of senna, it will transform into one of the lemon-yellow adults. This species is one to watch. There seems to be a clear increase in southern/tropical butterflies (and dragonflies) north. Cloudless Sulphurs' normal range is the Gulf states and south into Central America. Their northward expansion is telling us something about the environment. Thanks to John Pogacnik for providing these wonderful photos. 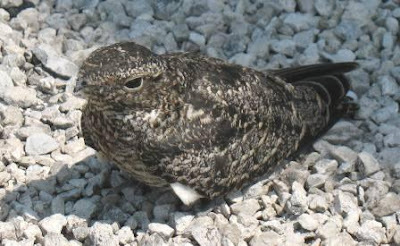 Dan Adamski recently sent along photos of a Common Nighthawk that is nesting atop the medical building at the University of Toledo. Then, the female was harboring a freshly hatched chick - a tiny ball of fluff. Today, Dan sent along photos that he took just this morning, and here they are for our viewing pleasure. Thank you very much Dan, for sharing this experience with us. It's not every day one gets to monitor the progress of young bullbats. Mother Nighthawk. August 5, 2008, Toledo, Ohio. Look closely. In a bit tighter, and you can see the approximately nine day old chicks huddled under the adult. 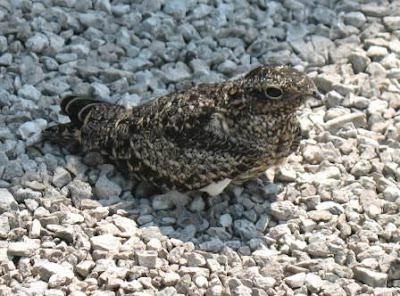 In Common Nighthawks, females do all the incubation and brooding; males hunt and deliver food. A closer view of the youngsters. In the first post, we could see only one young. Dan must have found the nest right after the first egg hatched, and the second had yet to spill forth the baby bullbat. Both are in fine form now, and growing like weeds. Seems pretty late in the year for nesting; most nighthawks nest in early to mid-June around here, I think. 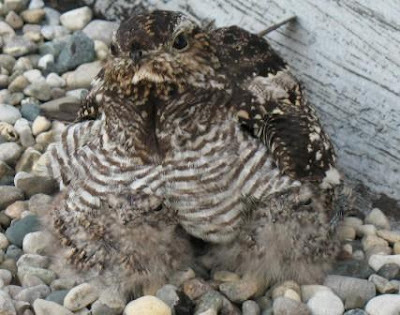 According to the wonderful Nests, Eggs, and Nestlings of North American Birds by Paul Baicich and Colin Harrison, Common Nighthawks begin making their first trial flights at 23 days. By my reckoning, they should start imitating the Wright Brothers in about two weeks. I'll look forward to photo updates from Dan, and will share them when I get them. Thank you Dan, for letting us enjoy these nighthawks! There are an estimated 35,000 species of orchids so far described worldwide, making it the King of flowering plant families. Maybe that's why many people, myself included, get so excited when they spot one in Ohio. Only 46 native species are found in the Buckeye State, or about 0.0013 of one percent of the global total. No wonder we get a jolt when we stumble across a representative of this largely tropical group. Last Saturday, a small group of us explored a very interesting Adams County-like prairie in western Holmes County. In the adjoining scruffy woods, we found many of the above, one of Ohio's most common orchids. Downy Rattlesnake-plantain, Goodyera pubescens, may be fairly common but it is always a treat to find, and is sure to be commented on but viewers. I suspect far more people are familiar with the long-persistent leaves, which are visible pretty much year-round, than are familiar with the midsummer blooms. These basal rosette leaves are quite distinctive, and if you were to find anything similar that WASN'T this species, you'd have quite a find on your hands, at least in Ohio. One reason flowering Goodyera may be missed is due to the wheres and whens of their blooming. On Saturday, August 2, the plants that we saw were just coming into bloom. This is a hot time to be exploring what at this season are rather uninteresting habitats, botanically. Along with the relative lack of blooming associates in the shady woodland habitat, and heat, come plenty of biting insects. People tend to shun midsummer woodlands, thus missing this beauty. Almost all orchids have interesting flowers, at least on close inspection, and Downy Rattlesnake-plantain is no exception. Check a woods near you soon, and maybe you'll catch it.